It seems to me that the e-mail and catalog marketing industry reached an inflection point at the end of 2007. Many multichannel brands experienced productivity decreases in both e-mail and catalog marketing. This is surprising, because we've been told for the past seven years that these two crafts must be integrated, and are essential to the success of a multichannel marketer. The trend is independent of the economic downturn that began in Q4-2007. Multichannel marketing, in the form pundits thought it would take, died in 2007. It actually began to die long before 2007. Since 2003, 145 million beleaguered phone owners said "no" to telemarketing. Since 2004, Can-Spam gave consumers some say in the deluge of e-mail marketing they receive. Coupled with spam filters, consumers are at least able to combat the ridiculous flow of garbage they receive each day (for me, 55 spam messages and 5 valid e-mails in the past sixteen hours). We're using DVRs to avoid television advertising (and in many ways, we're simply avoiding television), mitigating the impact of that channel. We're abandoning newspaper subscriptions, another time-honored channel. In 2007, services were created to help consumers gain control over their physical mailbox. In 2008, this trend may approach crisis mode for some catalogers. We'll only have our own online customer mailing strategies and customer acquisition strategies to blame. Over the next few years, consumers will awaken to the fact that Google and brands are tightly integrated, maybe too tightly integrated. Consumers will demand to have ownership of online privacy. Don't expect Google give up any ground without a fight. What a dichotomy. We believe we have to execute brilliant multichannel efforts. Consumers are telling us they are tired of multichannel efforts. Where does this leave us, as marketers? In 2008, I will spend a lot of time talking about how we use information to better understand customer behavior. More specifically, I will talk about the inflection points where customers no longer have interest in one form of advertising, or one channel. These inflection points are where you, the catalog and e-mail marketer, will become more profitable, and will anger fewer customers. This is the essence of Multichannel Forensics. Hamilton Davison, Executive Director of the American Catalog Mailers Association, left a comment that is worth publishing as an article for all of our catalog audience to read. Kevin: Three cheers for highlighting some of the more important trends coming at the catalog community in 2008. Thanks also for putting the ACMA in your blog so my Google alert would let me know you posted something I should respond to. I concur that we must monitor what is being said about our brands and company, responding when we can. Without this, the conversation lacks balance and meaning. We must also monitor what is being said about our industry for the same reason. If one has been following popular print, net and broadcast media coverage concerning cataloging over the past three months, and assuming catalogs are an important part of one’s marketing overall mix, one must be deeply troubled by some popular notions that seem to be emerging: “cataloging is not eco-friendly” or “catalog companies are indifferent or do not honor the interests of customers.” Both of these assertions – wholly unopposed as far as I have been able to tell – are completely false. The catalog companies we work with at American Catalog Mailing Association are customer focused, corporately responsible and completely committed to environmental stewardship. 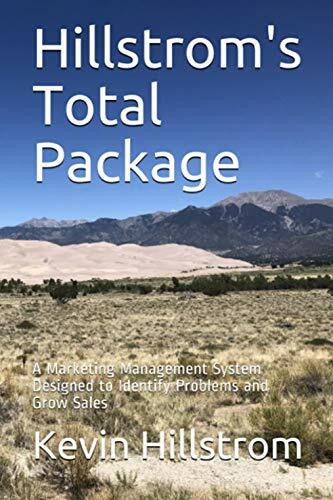 ACMA catalogers I speak with regularly relate changes to their business processes, purchasing specifications, supplier compliance requirements, and marketing decisions made to specifically accede to customer preferences or global concerns. Unfortunately, as you point out in your December 26th entry, no one seems to be telling this side of the story, nor extolling the environmental positives of cataloging. Unfortunately, ACMA is not currently configured to address this industry need; it is up to our members and board to determine if this is a focus area for our new association. However, you do touch on some areas the ACMA is very active in. “The silent partners pointing [us] toward a future that we find increasingly difficult to understand and control” are external parties on whom catalogers depend and who increasingly control the economic environment underlying catalog success. A properly organized and funded trade association can make significant progress impacting some of these external influencers to a degree difficult for even the largest (>$1 billion) companies and virtually impossible for smaller companies. One of the more significant external influencers is the USPS. ACMA has been actively addressing the postal environment. Our work in this past eight months has convinced us that this industry can manage its postal affairs more effectively than in the past. With so many issues on the table that will control our future for decades, provided we continue our aggressive work, 2008 will be a much better year than the one now ending. ACMA is also at work to understand better the issues surrounding do not mail, consumer choice and the environmental impact of catalog mailing. We expect to take a public position on these issues in 2008 and to work with the catalog community and the broader public constituency to help navigate across these complex and related issues. As an industry we must come together to proactively manage our business environment. There is an enormous amount we can do together efficiently. ACMA is a perfect vehicle for this. While we are puny compared to the other established trade organizations covering this market space, unlike most others we are wholly focused on issues for those merchants who use catalogs as an important part of their business strategy. Yet with only 60 out of an estimated 20,000 catalogers actively supporting our work, we must continue our rapid growth. In 2008, I would challenge all such firms to take a close look at ACMA and to consider getting involved with us. We cannot continue this work without significant support from all catalog merchants. Thank you for your work to highlight some important issues. I look forward to continuing the conversation in the year to come! I am including text from comments received by Catalog Choice Executive Director Chuck Teller. I think it is important that our catalog audience get to hear all sides of this discussion. In 2008, there will be a conversation between consumers and merchants about eco-friendly and privacy matters. I look forward to having you and as many members of the multi-channel merchant industry involved in the conversation. I know the consumers are ready to voice their opinion. I like the fact that you refer to Catalog Choice as an eco-friendly organization. There is a seat at the table for merchants who want to be eco-friendly. In 2008, we will be rolling out a series of Eco-Friendly Best Practices. My only request at this time is to not add the pre-fix "third party". Catalog Choice and our sponsor organizations (NWF, NRDC and Ecology Center) are not "third-parties". For example, the Ecology Center runs the curbside recycling program in the city of Berkeley. We are an integral component of the direct marketing lifecycle. We do the dirty work of driving around picking up those recycled catalogs. Happy New Year - looking forward to 2008. Great post. I think I will point to it from my blog over at Catalog Choice. One item I would like you and your readers to consider is how you can work with Catalog Choice to drive more sales and communicate with your customers that are using our service. We have some programs that we are developing for merchants. Sign up for your free Merchant Account at http://catalogchoice.org/merchants to start your Extreme Makeover. Many of you asked me to spend more time talking about "do not mail" and "green/sustainability" issues. The past week provided stimulating consideration of these issues. This DMNews article spends a bit of time talking about the DMA's response to "do not mail" legislation, suggesting potential solutions are maybe nine months away. By that time, third party catalog opt-out lists may have garnered enough market share to supersede legislation. Momentum really picked up over the past few years. Folks are getting "unwanted" catalogs. As an industry, we have to ask ourselves why this movement is happening. What did we do that caused us to be considered in the class of spammers and telemarketers, considering our proud, century-long history of enabling shopping "at distance"? More specifically, what business practices did we change over the past few years, to cause customers/prospects to experience such displeasure? What changed about our customer acquisition practices, or our housefile/channel mailing practices? The answers are probably different for every cataloger. But the common themes are so obvious. Salaried employees at Lillian Vernon are let go days before Christmas, according to The Consumerist website. The article cites rising shipping costs as the reason for the terminations. Add shipping costs to the list of silent partners determining the future of cataloging. If you had told me two years ago that 1,020 folks would spend the day after Christmas reading an article I self-published about the catalog industry, I wouldn't have believed you. That's how fast the craft known as cataloging is changing. 2008 will be a year that demands change in the multichannel cataloging and retail industry. A Conversation Is Happening All Around Us. Are We Listening? When I wrote about Catalog Choice, an eco-friendly organization encouraging consumers to reduce catalog mailings, leadership from Catalog Choice left comments for our community to read. The DMA and ACMA did not participate in the discussion. In 2008, multichannel catalog and retail organizations will be forced to monitor what is being said about them, and might even begin participating in the discussion. In 2007, when I wrote about multichannel catalog and retail organizations, I noticed a half-dozen or so visits from the brands I wrote about, within six hours of publishing an article. Some of you are monitoring what is being said. In 2008, some of you will actively participate in promoting your brand in a positive light. For catalogers, this will become an essential part of the marketing mix as eco-based organizations pressure us to change. Multichannel catalog and retail organizations spent most of the past decade installing an e-commerce infrastructure. In 2008, we will embark upon an overhaul of our information systems. No more mainframe-based reporting systems, or weekly updates of customer information. We will start the process of integrating clickstream, e-mail, call-center and retail information into one real-time customer database. It will also become painfully obvious that we can no longer manage our brands on the basis of key codes. This realization will cause pain. We'll also figure out that we truly know little about the long-term impact of our marketing decisions. We'll realize that we've been led astray by our hyper-dependence on matchback algorithms, and will begin to put the analytic infrastructure in place to understand the combined impact of traditional marketing, catalog marketing, e-mail, search and online marketing. We will be baffled and confused by what we learn, because what we learn won't tie out with what we've been taught about "multichannel marketing". In 2008, we will realize that systems and software give us the capability to do great things, but people are what really matter. Many will invest in systems and software to obtain a competitive advantage. Some will outsource customer intelligence to co-ops, list processing vendors, or inexpensive oversea analytics organizations. The best brands will pay a premium to have the brightest individuals work for them, either on-staff or via flexible contract arrangements. In 2008, catalogers will realize that we've given up control of our own destiny. A power struggle will begin to form in 2008. Catalogers may (should) form unusual alliances with competing catalog brands to "have a say" in our future. Catalogers will realize that a host of silent partners are actually pointing our brands toward a future that we find increasingly difficult to understand and control. Co-Ops And List Processors, Even More So If They Run Analytics Or Host Your Database. Your E-Mail Marketing Delivery Vendor. Google, A Brand That Ultimately Determines Your Online Reputation As Well As Your Online Sales Trajectory. Vendors Who Supply Best Selling Merchandise Lines. Big Box Retailers Who Mimic Your Innovative Products Within A Few Months At Lower Prices With Better Quality. Bankers Who No Longer Offer Easy Access To Cash For What Used To Be Called The Middle Class. In 2008, we will have to truly compete for the attention of the consumer. No longer will consumers be running from retailer to retailer, flush with home equity proceeds. Economic downturns provide fantastic opportunities for innovative brands willing to embrace change. In 2008, decisions will need to be made quickly. Very quickly. We'll find we cannot make rapid decisions with centralized control, yet we cannot control our businesses with rampant, de-centralized activity. We'll battle this problem for several years. 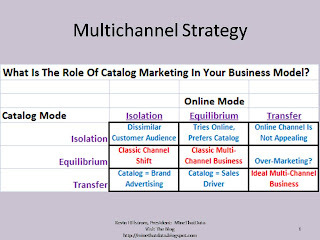 In 2008, we'll realize that a decade of pundit-speak about having to be "multichannel" didn't result in improved sales, EBIT, or customer retention. Instead, we'll learn that we're simply going through an epic transformation in the way that consumers interact with brands. We'll learn that free next-day shipping, free returns, fair prices and spectacular customer service mean a lot more to consumers than a beautifully-integrated e-mail, paid search and catalog marketing program featuring the same product and creative styling across all channels. And once we realize that customer service matters more than multichannel marketing, we'll be playing catch-up with brands that have a huge head start in this arena (i.e. Zappos, a single-channel brand that dominates online shoe sales). We'll descend upon Orlando in May for the Catalog Conference (or the ACCM, per re-branding efforts from earlier this decade), eager to see how "other folks are innovating", but longing to go back to a time when cataloging was a beautiful and noble craft not being disrupted by the internet. As always, we'll adapt to change, but not without a heartfelt longing for the past. What Does 2008 Mean To You? Share your thoughts on how 2008 will bring change to the multichannel retail and catalog industry. What are the trends you plan to follow? How do you think our industry will change? What role will you have in the evolution of our industry? The love (customers/press/bloggers) / hate (some catalogers) relationship with Catalog Choice dominated my in-box and comments over the past week. We Americans love to assign blame. We love to hold people accountable. We also love to forgive people, and where possible, we love to rescue people from dire situations (i.e. Extreme Makeover, Home Edition on ABC). It's probably time we, as Catalog industry leaders, conducted a post-mortem on our own business practices, asked for forgiveness, and then rescued ourselves from what may someday become a dire situation. You're probably not knee-deep in complex business issues the week between Christmas and New Year's Day, so why not take a lap around the internet and learn a little about all the ways various folks hate catalogers. Read the comments that come after the articles. You'll notice that folks use phrases like "unwanted catalogs". You won't see somebody write something like "I've been a lifelong L.L. Bean customer, but I hate the fact that they send so many catalogs." So folks don't like our industry when we "send unwanted catalogs". Why Does Our Industry Send Unwanted Catalogs? There are many instances when we send catalogs to customers who may not want them. Customers who exclusively purchase via the online channel. Prior catalog customers who have not purchased in a long time. New catalog customers who weren't expecting an onslaught of mailings from a brand. Customers who have never purchased from our brand (i.e. customer acquisition). Catalogers directly control issues one, two and three. Circulation teams create profit and loss statements for customers in groups one, two and three. If catalogers lost money mailing those groups, the flow of catalog mailings stop. The fourth group is an intriguing one. Historically, a catalog brand could not survive without a massive customer acquisition effort. As a result, catalogers might mail half of their circulation to customers who never purchased from the brand previously --- with start-up catalogers and low-retention-rate brands mailing maybe eighty percent of catalogs to customers who have never purchased from the brand previously. Prior to 1995, catalogers rented the lists of similar catalog brands, and exchanged lists with other companies. In the past five years, however, there has been a dramatic shift in circulation away from rented/exchanged lists, to cheaper and better performing co-op lists. While the numbers vary, many catalogers allocate about half of customer acquisition circulation to co-ops (Abacus, Z-24, NextAction, I-Behavior, Circ Base, Prefer Network, Wiland Direct). So if the cataloger allocates half of circulation to customer acquisition activities (customers who have never purchased from the brand), and half of the customer acquisition circulation is allocated to co-ops, then that means that co-op statisticians decide who receives one out of every four catalog mailings. To be fair, this isn't dramatically different than cataloger practices in the early 1990s, when the Garnet Hill list might be rented by Newport News. In either case, customers received unsolicited mailings. There is a subtle difference, however. Customers might have been tolerant of receiving catalogs from a "similar brand" ... the fundamental difference between Eddie Bauer and L.L. Bean isn't enough for the Eddie Bauer customer to get ticked-off when an L.L. Bean catalog arrives. However, the co-op statistician uses equations to decide who receives catalogs. And equations, while more precise and profitable than list rental/exchange models, will frequently target customers incorrectly. If the co-op statistician notices that apparel customers have an "affinity" with another merchandise line, the statistician builds that information into the model. This might result in an increase in response rate, from 1.5% to 1.65%, a wonderful result for a cataloger. But it could also mean that twenty or thirty percent of the names mailed are "different". It is in this twenty or thirty percent that problems occur. If the statistician gets creative, there will be better response, but more "risks" are taken with the customers who are mailed. Co-ops may substitute "brand affinity", which customers might be tolerant of, with "product affinity", which customers might not be tolerant of (this is simply a hypothesis of mine --- co-ops, feel free to jump in and comment about this). Is this the fault of the co-op? Does the co-op provide enough information for you to know who the co-op is mailing on your behalf? Do you provide enough oversight of the co-ops to know who they are mailing on your behalf? Did you pre-think how your customers might respond to knowing that you dumped their purchase information into multiple co-ops, so that they could be mailed complimentary offers by competing brands? It might be time to consider asking customers, bloggers, and the press to forgive us. Especially if co-ops determine the names/addresses of individuals who receives a quarter or more of your total circulation. Here are nine ways for us to begin to repair our reputation, and be good stewards. It is time for the DMA to do something with the $10,000 to $50,000 each of our organizations pay them each year. And that something is not telling us to "just say no" to Catalog Choice. If one of our customers or one of our prospects doesn't want to receive a catalog, we have to honor that request. Honor the customer, and challenge the DMA for modern solutions and real action. Have you considered joining the American Catalog Mailers Association? It won't cost you the $10,000 to $50,000 it costs to join the DMA. While this organization believes that the response of the press to the folks at Catalog Choice "give them the willies", I perceive this organization wants to "do what is right". Best of all, you could play an active role in doing "what is right". Make it easy for your own customers to opt-out of catalogs. You make it easy for customers to opt-out of e-mail campaigns, don't you? The reality of the marketplace is that you have to do this for catalog mailings as well. Times have changed. Strongly consider the mailing strategy you employ for online-only customers. These customers may consider you as an online brand, not as a cataloger, hence their dissatisfaction of your online mailing strategy. Give customers a say ... give them an option to receive half of your mailings, and brand this choice as being "eco-friendly". Test the living daylights out of this ahead of time, so you know the ramifications this will have on your business. Oversight ... do a "deep dive" with the co-ops. If you allow co-ops to mail a quarter of all your catalogs, you have given a quarter of your brand authority to co-ops. Wow. Do you oversee the vendors you work with in China to ensure that the working conditions are acceptable? If you do, don't you think you should provide the same oversight with co-ops? And if co-ops won't provide transparency, well, then, you need to think about your relationship with them, don't you? The folks who work at co-ops are good people, they will respond to a catalog industry that demands oversight. Would a little "PR" hurt? Catalog Choice gets picked up by major publications all over America, quoting the billions of trees catalogers harvest each year. As a result of our inactivity, Catalog Choice muscled in, and now has a seat at our Executive Table, managing our brands for us. Why can't catalogers go on the offensive? How much would it cost for a catalog to plant "x" trees each year? And how much good will would be done by having the press, bloggers, and TV stations all reporting the fact that two hundred employees spent a random Wednesday in July planting trees? Why aren't we good stewards? Why don't we "toot our own horn" when we do good? Why don't we tell our customers that we're planting four trees for every tree we cut down? And if we don't plant four trees for every tree we cut down, why don't we start doing this? Speaking of PR, why not tell the world that over the past five years, we spent "x" dollars less on catalog mailings, moving that money into online marketing that theoretically reduces our carbon footprint? Launch new initiatives online. Test various new products and brands online, and via e-mail. Use online marketing to test the initiatives before rolling out new products and brands via paper. And then tell the world how many trees you saved by doing this. I could go on an on. Catalogers, it is time for an Extreme Makeover. It is time for action. Last year we had a healthy number of submissions (see these four submissions). This year, zip. So click on one of those links, and enjoy "retro" content! As usual, many folks in the catalog/retail industry communicated with me in the past week about the role of a catalog in our modern multichannel world. Communication sometimes breaks down when talking about online orders that are "matched back" to a prior catalog mailing. Catalog purists consider these to be "catalog orders". While I haven't talked about this concept on the blog, I view these orders different than most industry experts do. These orders are a combination of advertising channel (catalog) and physical channel (online). The matchback algorithm gives credit to a catalog, and the analysis stops. My thinking evolved considerably over the past twelve months. These days, I'd prefer to run a Multichannel Forensics simulation on each combination of advertising channel and physical channel. It is the interplay between advertising/physical channel combinations that matters. Our industry just doesn't talk about this. Catalog Key Code, Order Mailed To Company. Catalog Key Code, Order Via Phone/Fax. Catalog Key Code, Order Via Sales Staff. Catalog Key Code, Order Via Website. Catalog Key Code and Paid Search URL, Online Order. Catalog Key Code and Natural Search URL, Online Order. Catalog Key Code and Portal Advertising URL, Online Order. Catalog Key Code and Shopping Comparison URL, Online Order. Catalog Key Code and Affiliate URL, Online Order. Online Order, E-Mail Coded Order. Online Order, Paid Search URL. Online Order, Natural Search URL. Online Order, Portal Advertising URL. Online Order, Shopping Comparison URL. Online Order, Direct Load or No-Source. In this example, there are sixteen "channels", if you will. Before any simulation is run (and this requires a healthy simulation ... forecasting sales five years from now in each of these "channels" is not a trivial exercise), I'd run the migration probability table (this step is exceptionally easy to do). The table illustrates how customers who ordered from any of the sixteen "channels" last year behaved this year. And this is what is really important, folks. For instance, where does a customer who ordered via "Catalog Key Code, Order Via Website" migrate to in the next twelve months? Does a customer who only orders online ever use a catalog key code in the future? If that customer always utilizes a catalog key code in the future, then you know that the catalog matters as an advertising channel. However, if this customer migrates to ordering online (without a catalog key code), or starts ordering with online advertising URLs, then the catalog is "losing" this customer to other advertising channels. There are many readers of this blog who are critical of the content, especially when it comes to catalog marketing. All too often, critiques are based on beliefs, on non-data-related observations. I'd love it if catalogers ran this type of analysis, and proved that cataloging is vital to the future of the direct marketing industry. Heck, I'll publish your findings as an article on this blog for 1,100 folks to see, findings that prove the essential need for catalog marketing. I'd be just as happy if catalogers ran this type of analysis, and found out that customers were no longer using the catalog channel like they did in the past. I'd be happy either way, because catalogers and vendors were using actual facts to defend or refute the craft of cataloging. The DMA is forwarding an article from Business Week entitled "Cutting The Stack Of Catalogs", featuring an organization called "Catalog Choice" that allows consumers to easily opt-out of catalog mailings. By the way, Catalog Choice has a blog. This organization "appears" to have an open conversation with consumers. Who "appears" more open, honest and transparent --- this organization, or the DMA, an organization that used a one-way communication to paying members earlier this year urging them to not honor Catalog Choice requests? But that's neither "here nor there". Let's assume that Catalog Choice is acting with honesty and integrity. Let's assume that your customer is truly requesting to be removed from your mailing list. Let's assume that the DMA has your best interests at heart (which they do). If you respect your customer's wishes, and you operate your business with honesty and integrity, what should you do when your customer opts out of your catalog mailings via a third party like Catalog Choice? This isn't 1988. If the customer wants to purchase from you, she can use your website. Simply remove the customer from your list. Better yet, for every request you get from Catalog Choice, call the customer, and ask the customer if it was her intention to opt out of your catalog strategy. 2007 was a banner year for Multichannel Forensics (book, paper). The methodology was applied to more than twenty-five brands and more than one hundred products/channels. There are many insights and key learnings from spending a "year in the field". E-Mail Marketers: The dynamics of your business are more sophisticated than your metrics allow you to measure. Your software tools and vendor community provide insights that don't allow you to see the full impact your programs have on the brands you manage. Overall, you provide more value than your measurement tools allow you to quantify. Search Marketers: There are rich dynamics/interactions between your channel and other advertising channels (e-mail, catalog, other online marketing). If you work for a cataloger, make sure you get proper credit for the sales you generate!!! Catalog Fact #1: Matchback algorithms are flawed among the audience of customers who purchased in 2006/2007 using both the mail/phone channel and the online channel. All of the rhetoric you've heard over the past decade is less applicable to today's research-oriented multichannel customer. For these customers, catalogs are only a "component" of the purchase process, not the "reason" for a purchase. Catalog Fact #2: I'm convinced there is a fraction of your customer file that will always use catalogs to place orders over the telephone. Expect this audience to get progressively smaller over time, creating significant pressure on profitable catalog marketing activities. Retailers: Websites plays a major role in the development of a healthy retail customer file. From a Multichannel Forensics standpoint, consider online advertising "channels" in your simulations, to understand which advertising "channels" foster long-term retail-loyal customers. Segments: One individual told me that he ran Multichannel Forensics analyses at a "segment" level --- meaning that he ran individual analyses for different RFM customer segments. The insights are more enlightening than the high-level work you share with your CEO. Forecasting: Surprisingly, most folks prefer using the simulation tool to build five year sales forecasts. The actual dynamics, for many, are less important than the end-point each product/brand/channel are evolving toward. Websites: The most brilliant work I observed this year is in the use of Multichannel Forensics for key product classifications in the online channel. There are rich dynamics and interactions occurring between customers and online product classifications that almost all brands fail to see --- brands simply don't have the tools necessary to understand and capitalize on the complex interactions that are occurring. New Customers: There continues to be an ongoing battle between customer retention/loyalty advocates, and customer acquisition proponents. Multichannel Forensics repeatedly indicates that customer acquisition is the "secret sauce" that fuels successful businesses. Don't listen to that "it costs eight times as much to acquire a customer as it does to retain an existing customer" stuff. Keep acquiring customers. Control Groups: Multichannel Forensics provide brilliant insight for folks who execute year-long catalog or e-mail holdout groups. The Square Root Rule: Multichannel Forensics combined with The Square Root Rule provide fantastic insight into the interaction between a healthy business, and the differing rates of advertising required to achieve a healthy business. These represent a fraction of the learnings from 2007. What did you learn about your business, after conducting a Multichannel Forensics analysis? RFM was a brilliant step in the evolution of catalog circulation. In so many companies, this simple methodology is still used today. Then other techniques became popular. In the 1980s, regression modeling became a worthy endeavor, thanks to the computing horsepower of mainframe computers. In the 1990s, neural networks became popular, as desktop computing allowed folks to build these models. This methodology requires "trust", because one cannot simply understand "what" makes a neural network tick. In part, this "trust" factor limited the adoption of neural network methodologies in catalog circulation. RFM, regression, or neural networks are designed to "predict" if a customer will respond to a catalog or e-mail campaign, given a set of historical variables. Predicted Spend = $3.00 - $0.05 * (Months Since Last Purchase) + 0.50 * (Lifetime Orders). In this framework, each customer is evaluated, based on each customer's traits. Recency = 3 Months, Lifetime Orders = 1, Score = 3.00 - 0.05*3 + 0.50*1 = $3.35. Recency = 24 Months, Lifetime Orders = 2, Score = 3.00 - 0.05*24 + 0.50*2 = $2.80. In 1994, this methodology worked really well (ok, I know the folks who worked at Lands' End and L.L. Bean would be impacted by the theories about cannibalization brought forth by Bill End, but let's skip that for now). But now it is December 2007, and the entire world has been rocked by the introduction of e-commerce (and in the rest of this article, feel free to substitute the word "e-mail" for "catalog", as the concepts are identical). You see, e-commerce crippled the analytical methods used by most catalogers. All of a sudden, customers were able to order from multiple channels, and not use the source codes or key codes that helped catalogers identify the source of more than eighty percent of orders. Our vendor community listened to our concerns, offering us a "matchback" algorithm that identified every customer who received a catalog, then placed an order on the internet over the next "x" weeks. We're very thankful we were given this methodology. Thankful, that is, unless your customer base starts ordering merchandise on their own, regardless whether a catalog was mailed to them or not. When this happens (i.e. "multichannel customers"), traditional analytical techniques are crippled. There are several ways to deal with this challenge. First, the cataloger must fully utilize mail and holdout groups. This is an essential part of multichannel cataloging that is sorely missing these days. The holdout group shows you all of the online orders that happen without catalog marketing. Second, the statistical modeler has a series of choices. Two regression models can be built, one for the mailed group, one for the holdout group. The incremental difference between model scores is the "incremental" benefit of the catalog. While theoretically reasonable, there are a myriad of reasons why this methodology can fail ... in particular, discrepancies between the slope of the recency variable between models. Some folks build "interaction" models, which predict response, using interactions between "mailed and holdout groups" and key predictors. In other words, there might be a variable called "recency" (months since last purchase). There might be another variable called "mailed recency", which is equal to zero for all folks in the holdout group, and equal to "recency" for all folks in the mailed group. The difference in coefficients is the impact of mailing a catalog, or sending an e-mail. This form of "interaction" modeling suffers when holdout groups are small, or when many statistical assumptions are violated. incremental difference between a group mailed a catalog, and a like group that is "held out" from the mailing. If you have the luxury of hiring statistical modelers, this represents the holy grail of catalog modeling ... being able to nail this "incremental difference". Six years at Nordstrom, having some of the best modelers in the world at my disposal, proved that doing this right is truly "the holy grail" of catalog modeling. Many catalogers use modeling services from catalog vendors. If this is you, challenge your vendor to develop "incremental models" that predict the incremental impact between mailed and holdout groups. For the majority of catalogers using RFM, I wouldn't worry a whole lot about this topic. I'd spend time doing the mail/holdout groups (especially among "multichannel customers"), comparing the results to your matchback results. And for e-mail marketers, this is a concept that might be foreign to your vendor community. Start the mail/holdout tests, and if the results are significantly different than your typical metrics, you know that "incremental" models make sense. I ran across this Smartmoney article from nine years ago, asking "Can Lands' End Make It on the Web?" Entertain yourself with stories of Fingerhut, Federated, Shop at Home, Lands' End and Spiegel. Most interesting to me is the significant transformation each of these companies went through since this article was written in early 1999. Keep this in mind when pundits tell you what you "have to do" to survive in our multichannel world. A New E-Mail Marketing Director, You Chose This Person? One of the most popular things I've ever written is from last week: "Who Would You Hire To Be Your New E-Mail Director?". Your current Manager of E-Mail Marketing. Your current Director of Catalog Circulation. The Director of E-Mail Marketing at your competitor. Your current Manager of Online Marketing. The Director of Client Services at an E-Mail Services Provider. One of your Store Managers, a person who runs a rogue store E-Mail Marketing Program. I was surprised that an industry veteran at an E-Mail Services Provider was not more highly considered by those who commented. I purposely asked about a rogue Store Manager who runs a bootleg e-mail marketing program from his/her personal computer, using Outlook Express. Predictably, those who commented were upset with this "candidate". One of the genuine opportunities for the e-mail marketing industry in 2008 is to "become more inclusive". Overall, I've found e-mail marketers to be very bright and talented. But e-mail marketing can sometimes be like a high school clique ... highly specialized folks who are knee-deep in the funk required just to get an e-mail into your inbox. The struggle to simply get e-mails into customer in-boxes comes at a price, however. Not one person who left a comment asked why the rogue store manager was running his/her own campaign. Not one person asked if the current e-mail marketing team was meeting the needs of this important sales channel. For e-mail marketing to be successful in 2008 and beyond, there has to be a focus that goes beyond deliverability and versioning and targeting and trigger-based programs and best practices and subject line testing and Outlook 2007 rendering issues and the like. E-mail marketers must also "include" all business partners. There needs to be less talk about technical issues. There needs to be more talk about the specific needs of a business partner. I've been associated with e-mail programs that were usurped by "rogue" leaders in other departments. I've seen the back-biting that happens when the "rogue" team gets burned repeatedly by the e-mail marketing team. I've seen the contempt the e-mail marketing team has for the "rogue" team. I've measured the effectiveness of each program. In 2008, it is time for e-mail marketers to be "more inclusive". It is time for e-mail marketers to raise their profile within our multichannel organizations. Gift Cards are the wild card of Christmas retailing. Consumers love these little plastic wonders, and for good reason. No longer do you have to receive a scarf from Aunt Priscilla for Christmas. But for multichannel catalogers, gift cards represent significant challenges. Many multichannel businesses record transactions from customers who redeemed gift cards. Not many multichannel businesses record transactions from the customer purchasing gift cards. These are the transactions that are fun to pay attention to. If you can segment gift card customers, watch their behavior during the rest of the year. In fact, purchaser and redeemer behavior can be put in the context of a robust Multichannel Forensics analysis ... you could have three channels, say online buyers, gift card buyers, and gift card redeemers. 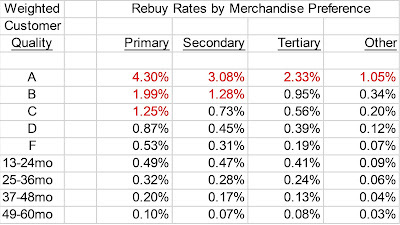 One would analyze the repurchase habits of each group. Furthermore, one would pay close attention to the product these customers purchase. This is a topic of increasing importance for inventory managers, given that some businesses do 10% or more of their "volume" in gift cards during the final few weeks before Christmas. Best Conferences In Our Industry? If you had to send somebody from your team to one industry conference in 2007, which conference would it be, and why would you send somebody from your team to the conference? On another note, what is missing from the current array of conferences and topics dominating the direct marketing world? Who Would You Hire To Be Your New E-Mail Marketing Director? Let's say that your multi-channel brand is looking to hire an E-Mail Marketing Director. You are the VP of Marketing for this brand, leading an e-mail program that sends out one general version of an e-mail campaign each week to the entire e-mail list. Who would you hire, and why? What would you look for in a candidate? Choice #1 = Director of Catalog Circulation. This person has 22 years of direct marketing experience, and has worked at your company for the past 12 years. She is well-respected at your company, knows the politics of your company, and knows targeting strategies inside-out. Last year, this person won your brand's award for outstanding skills in managing people. Choice #2 = Manager of E-Mail Marketing: This individual has 4 years of e-mail marketing experience, all at your company. He works well with your e-mail delivery vendor, and keeps up with industry news via conferences, trade journals, discussion groups, and blogs. He knows more about e-mail marketing than anybody else in your company. Choice #3 = Director of E-Mail Marketing For Your Top Competitor: This person has ten years of e-mail marketing experience, and based on your interview of this person, manages an e-mail program that is 30% more productive than your current program. Choice #4 = Director of Client Services For A Key E-Mail Vendor: This candidate has no client-side experience, but is well-versed in the challenges facing the e-mail marketer, and knows the strategies employed by your competition. Choice #5 = Manager of Online Marketing: Your very own online marketing manager developed a highly profitable online marketing program for your multi-channel brand, and is looking to expand her horizons. She has six years of experience, all at your company. Choice #6 = A Store Manager: One of your store managers runs a rogue e-mail marketing program that is believed to have increased his comp-store sales by 9% last year. He feels he can deliver improved results for all stores, though he acknowledges he knows little about e-commerce or catalog channels. Because stores comprise 62% of total sales, this candidate believes he is well-qualified to meet the needs of the brand. Yesterday, we talked about individuals who have "it". Today, we take a brief look at the subject of talent. The vast majority of folks who have talent don't have "it". To be successful, talented folks have to navigate at least two interesting dimensions within any company. First is the style of the folks who "truly run the company". I'm not talking about the CEO or President or that ilk, though those could be the folks who truly run the company. Rather, I'm talking about the individuals who, by experience or talent or ego or ruthless power trips gained control of the organization. You know exactly who these individuals are. Minutes after making your first decision as a leader, somebody asks you if you "ran your idea past Janet", and you say "who's Janet?" You just learned who truly runs your company. What is important about these individuals is their style. Do they "control" the agenda, or do they delegate "control" to others? For instance, maybe you work for an online retailer that is really run by the information technology department. Regardless what the CEO says, the information technology department really determines what happens, and what doesn't happen. Does this team determine strategy? If they do, then your organization has a "Leadership Controls" style. Does this team do what the business wants them to do? If that is the case, then your organization has a "Leadership Delegates" style. Either way, this team is the unofficial leadership team in your business. The second dimension focuses on the company culture. Does your culture support "individuals" making independent decisions, or does your culture require "teams" to make decisions? Combined, there are four different cells that an organization can be classified into. I previously worked at three large apparel companies. Let's see how they fit into this framework. From 1990 - 1995, I felt that Lands' End fell into the "Delegates / Independent Actions" quadrant. The leaders generally allowed each area to make decisions that were in the best interest of each area. In fact, much of the consternation between people occurred when divisions did not get along, or needed to work well together. Independent actions were generally preferred. While there were teams, teams generally didn't make big decisions. Overall, the culture supported smart people doing what they felt was best for the portion of the business they were accountable for. From 1995 - 2000, I felt that Eddie Bauer fell into the "Controls / Teams" quadrant. I can specifically remember our CEO entering my office, telling me that I could no longer publicly share consumer insights, and that going forward, all information would flow through him, allowing him to shape the message that employees heard. There's nothing inherently bad with that --- but it is a form of leadership "control" --- leadership isn't delegating my area of expertise to me. Furthermore, the culture loved "teams". In 1997, Eddie Bauer relieved the Catalog Executive of his duties. His role was replaced by the "Catalog Business Team", a group of individuals who jointly determined where the catalog/online business would head. This team worked ... we had the most profitable year in the direct division's history in 1999. Team cultures can also have a hard time making significant changes, when necessary. 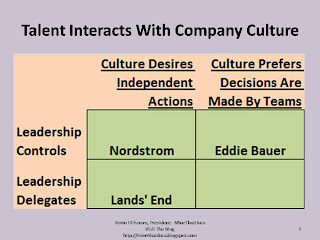 From 2001 - 2007, I felt that the Nordstrom culture was in the "Controls / Independent Actions" quadrant. This is one quirky quadrant. At Nordstrom, there were a group of individuals who were the true leaders, the folks who truly made decisions. These folks generally complemented the strategy suggested by a half-dozen Sr. Leaders. Combined, these fifteen or twenty folks "controlled" what was done. Try something outside of the framework of these twenty individuals, and you would struggle. Conversely, the culture loved independent decision making, advocating a "use your best judgment" approach to decision making. The lowest paid employee in a store had the authority to make decisions that nobody at Eddie Bauer would ever allow somebody to make --- several cross-functional teams would need to collaborate at Eddie Bauer to allow store employees to have wide-ranging decision making authority. Talent must either fit into the appropriate quadrant, or must be able to successfully change the organization. At Lands' End, a talented Eddie Bauer person would be criticized for wanting to have too many meetings, for trying to build too much consensus, for never getting anything done. At Eddie Bauer, a talented Nordstrom person would be criticized for "being a cowboy", for making too many decisions without the proper study and consideration required of a disciplined company. And at Nordstrom, a talented Lands' End person would be chewed-up and spit-out for not "following the rules" set forth by the true leaders of the company (I watched several former Lands' End employees get bounced based just on this criteria alone). Nordstrom would genuinely appreciate the entrepreneurial spirit exhibited by these folks, but would detest how these folks were not pointed in the direction that leadership was pointed in. There are many challenges associated with being "talented". For talented employees seeking employment opportunities, quadrant identification is very important. The prospective employee must determine if the quadrant the business falls into is congruent with his/her skills. If the quadrant is different, the employee has to determine whether s/he can fit into another quadrant, or whether the employee can "change" the quadrant. All too often, the employee tries to make everybody else change to his/her style, without considering what the organization "wants" to do. Maybe the employee was hired to cause change outside of the natural quadrant the brand fits into, in which case, the employee might have to create stressful situations. It is my opinion that truly talented leaders adapt their style to the quadrant their brand belongs to. Have you ever observed an employee who has "it"? I visited a lot of companies this year. Occasionally, I'd observe an employee who has "it". How do you know if an employee has "it"? In a meeting, this person will sit at one end of the table, so all can hear this person talk. Regardless of title, employees will ask this person for his/her opinion. If this person sends an e-mail to a large distribution list, many people respond. Executives say this person "knows what s/he is doing", even though the Executive seldom spends real time observing the work this person does. On Friday afternoon at 3:00pm, employees mysteriously gather around this person, sharing stories about some random topic. This person spends a lot of time combing trade journals, reading blogs, or doing research on topics not necessarily linked to his/her specific job function. And because of this habit, this person seems to be able to "see" the future better than the average person. When assigned a project, this person give the Executive what she asked for, gives the Executive what she wanted but was not able to articulate, and give the Executive what is "needed" for the company to succeed. This person has ideas that make a significant minority of people feel uncomfortable. This person does things that other employees say "can't" be done. This person does not appear to be overworked. S/he only focuses on stuff that is important, and seems to have a gift for determining what is important. This person doesn't need budgetary authority to make things happen. This employee isn't always on a "fast track" to Executive status. The individual is sometimes seen as a threat, or is occasionally viewed as not being a "good fit" for leadership positions. For some reason, people who don't report to this person do things for this person, helping this person succeed. While this person may have crabby moments, or an occasionally negative thought, overall, this person exudes confidence, optimism, joy and energy. If you ask this person what s/he is working on, you might be caught off-guard by what s/he says. If this person schedules a meeting, people show up on-time for the meeting. During my travels this year, the Executive quickly volunteers to me the individuals who have "it". My challenge to Executives is to "do something with 'it'"! Restoration Hardware Sales Shift To Catalog? Is That A Good Thing? Restoration Hardware Inc. has reported that a significant share of its revenues have shifted from retail to direct marketing sales. The company reported direct marketing sales for the third quarter that ended Nov. 3 were $97.2 million, an increase of $16.6 million compared to the same quarter last year. Restoration Hardware generated 56% of total revenues from its catalog in the third quarter this year, compared to 36% during third quarter of 2006. The Corte Madera, CA-based firm attributed the shift to greater direct sales to increased catalog circulation and adding more pages to catalogs. It reported $76.5 million in revenues for its stores in the third quarter. Wow! They must really be doing great, huh? EBIDTA was a loss of $15 million in Q3-2007, vs. a loss of $5 million in Q3-2006. In other words, Restoration Hardware lost 3x as much money in a quarter where "catalog" sales increased dramatically. Direct-to-Consumer (Catalog + Internet) sales were 56% of total ... Direct Magazine quoted that 56% of the sales were Catalog. Ugh. SG&A rose 4.1%, as the direct-to-consumer channel has a higher expense rate than the retail channel. In other words, sales shifted to the direct-to-consumer channel, where less sales flow-through to profit than in the retail channel. Also, pages circulated increased, adding to marketing expense. If you're reading Direct Magazine, you learn that catalog results were great! If you're reading the actual comments from management, you learn that direct-to-consumer (catalog + online) sales increased, but more marketing dollars were spent to cause this shift, and it required more operational expense to process the sales, in-part leading to a dramatic decrease in profit of $10,000,000 in the quarter. Also, if all those multichannel pundits are "right", why didn't all this catalog marketing, all of this paper in the mail, cause retail sales to increase dramatically? I thought paper drove sales in retail stores? Isn't that what we're told, over and over and over? Retail sales were down 24% vs. last year's third quarter. What do you do to filter the content you read via trade journals and vendors, or do you filter the content? Prior to the arrival of the internet, there was a semi-predictable cycle of business performance, one that occurred every two to four years. Year 1 = Poor Profit. In planning for next year, inventories were significantly reduced, while circulation/prospecting were reduced as well. In some cases, the leadership team was overhauled. Year 2 = Flat Sales, Better Profit. With lower inventory levels and reduced circulation, the fundamentals of the business were managed better, improving profitability. With sales flat or improved, and profit improved, business leaders put their foot on the gas. Circulation increased, prospecting increased, but inventories were still managed reasonably well, given the sour memories of the prior year. Year 3 = Good Sales, Good Profit. At times, there wasn't enough inventory to fill demand. With a good year in the books, business leaders became aggressive. Investment and inventory increased, especially inventory, because fulfillment levels were so poor in year three, and sales were forecast to grow fast in year four. Year 4 = Poor Profit. Inventory levels were bloated, and the investment didn't convert to profit at rates anticipated by leadership. This completed the business cycle. The direct-to-consumer business "started over" at "year one", if you will. Some of the best business years I've been part of followed this cycle. 1993 was a great year at Lands' End, followed by a sluggish 1994, and a terrible 1995. I went to Eddie Bauer, which had a great 1996, a sluggish 1997, an awful 1998, a great 1999, then a sluggish 2000. The internet seemed to change this dynamic. With phone/mail sales decreasing and online sales going sky-high, it became more important to focus on managing inventory by channel, managing investment by channel. With each channel having a common (but opposite) trajectory, maybe it was easier to manage the growth and profitability of a direct-to-consumer business. Next year, as online sales volumes flatten out, we may see the return of the business cycle. This will be very interesting to monitor. As you know, the online channel has disadvantages, when compared to the catalog/phone/mail channel. In catalog, when an item is sold out, you get to keep recording "demand" via the telephone. As customers continue to call for sold-out items, you record what the customer "wanted". This allows the cataloger to better forecast demand for the item next year. Online, items are "pulled" from the website when not available. This is considered a "best practice", or "great customer service". Maybe it fits the latter category. Of course, the online inventory manager is placed at a significant disadvantage. She doesn't have knowledge of how much she could have sold. So she's likely to underbuy the following year, limiting the growth of the online channel. Maybe this style of inventory management will dampen the impact of the business cycle. Maybe this prevents the inventory manager from over-buying in the online channel, limiting the risk of having too much inventory, a fatal condition for direct-to-consumer businesses. This post talks about a study from eROI about 3rd quarter e-mail marketing performance, suggesting that multichannel retailers have an opportunity to improve performance. If you are a retailer, you know that the vast majority of e-mail analytics tools significantly undercount multichannel opens and clicks. Retailers have a huge advantage when it comes to e-mail ... it is called stores! I've analyzed maybe four hundred different e-mail tests in a retail environment. In all cases, the open and click rates are below industry average. But over a five day period of time, conversion is literally doubled if you count the "incremental" orders driven to stores. Randomly sample 10% of your e-mail list. Split that segment into two groups. One receives your next campaign. One is held out, not mailed your campaign. After a week, measure incremental performance between the mailed group and the holdout group. You will see very different results than you are used to seeing. That's because traditional metrics don't include phone volume (which, interestingly, are often cannibalized) or store sales, in the results analysis. The table below illustrates the poor results that vendors will tell the world about, vs. the accurate results you'll see via your test and control results. Do you see the big difference? When measured like the vendors measure results, you get $0.09 per e-mail. When measured via test/control groups, you get $0.20 per e-mail, because you observe the incremental increase across all channels --- fulfilling the promise of "multichannel" marketing, huh?! To my multichannel marketing audience --- please don't get discouraged by folks who suggest your e-mail performance is poor. Just keep measuring things in an accurate manner, across all channels. Your performance is much better than the experts tell you it is! For the second consecutive year, you get the opportunity to publish content on The MineThatData Blog, courtesy of my Boxing Day promotion. Are you a catalog marketer with something to say? An e-mail marketer who wants to provide a different point of view? A search marketer looking to dazzle a new audience? An Executive or CEO who wants to pen an anonymous or authored post about relevant business issues? A business intelligence, web analytics pro or SAS programmer looking to share key insights? Then this opportunity is for you. Submit your article to me (via e-mail) by December 22. If your article is appropriate for this audience, I will publish it on December 26. This is a good opportunity for you to have your insights considered, please take advantage of it!! I recently had a discussion with an e-mail vendor. This person recommended that e-mail subscribers receive a different number of contacts. For instance, best customers (those that click-through an e-mail to a website at least two times a year) could receive three e-mails a week. However, customers who never interact with e-mail campaigns (though they opted-in to subscribe) should not receive e-mails, or should be asked to opt-in again. If you have customers who infrequently interact with e-mail campaigns, but opt-out at low rates and generate profit when e-mailed three times per week, why should the contact strategy be reduced to one time per week for infrequent e-mail responders? What is the financial benefit of reducing e-mail contacts? Would You Like A Copy Of My Catalog? Executive: I'm not sure you can help me. Heck, you probably haven't even requested a copy of my catalog, have you? Kevin: No, but I visited your website. Executive: See, that's exactly what I'm talking about. How can you possibly offer me useful insights if you haven't had a chance to thumb through my catalog? Catalogers are different than other marketers. You don't see e-mail marketers walking around with printed copies of their favorite e-mail campaigns. For some catalogers, the passion is about "the catalog", not "the product". And there's nothing wrong with that. I wish the e-mail, search, and general online marketing community had the level of passion and intensity that many catalogers have. Next time you meet with a catalog executive, see if s/he asks if you want to take home a copy of the most recent catalog. If the executive gives you a copy of the catalog, see if the executive also asks you to visit the website. This passion can blind catalogers. Sometimes, there's profit laying all around a cataloger, just waiting to be picked-up, if one is willing to look beyond the catalog. Need Your Input: Multichannel "War Games"
One of my favorite chapters in Malcolm Gladwell's "Blink" is the chapter about the war game our military played prior to our invasion of Iraq, when a rogue general simulating a fabled enemy managed to sink more than a dozen US warships. Which brings me to this evening's topic. I am strongly considering development a game that simulates management of the marketing expenses and ROI involved in a multichannel business. See, everybody talks about multichannel marketing. What we don't have is a tool that affords industry experts an opportunity to hone their skills in a semi-realistic environment. I would eventually use the game as part of a one-day seminar that I would offer businesses interested in such a tool. But in the short term, I would allow MineThatData readers to participate in the game, with the reader posting the best "sales and profit score" winning a prize to-be-determined. So, I need your input. Would this type of game be of interest to you? If so, what elements need to be included in the tool? Would your business consider purchasing such a service? And finally, what would an appropriate "prize" be for the winner? Spread the word, I'd like as much input as possible. Thanks! "Back in the day", understanding customer profitability was easy, straightforward. If you were a cataloger, you segmented customers on January 1. You summed what that segment purchased, you summed how much you spent marketing to that customer, and you calculated profit. All of your catalog expenditures were "controlled". You decided if you mailed the customer or not. Only in instances of catalog requests did the customer participate in the cost structure of your marketing program. Here are two segments of customers, one a pure "catalog" segment, one a "multichannel", i.e. catalog+online segment. What looks different, when you analyze these two segments? Here's one of those situations where "multichannel customers are the best customers, they just aren't the most profitable customers". Uncontrolled advertising expense causes this situation. Customers who shop the online channel use paid search, shopping comparison sites and affiliates (along with catalogs and other online marketing channels) to facilitate their shopping experience. As we know, paid search, shopping comparison sites, and affiliates aren't free. While the marketer controls the ad budget across these activities, the marketer seldom controls "who" uses these marketing channels. Therefore, "best" customers, those who used to be highly profitable, can become "less profitable", when the customer uses marketing channels that add incremental expense. An important first step is to understand this phenomenon across your customer base. Sum annual demand, by segment. Segments are created on January 1, and customers stay in this segment for the entire year. Sum "controlled marketing expenses" by segment in your database on an annual basis. Sum "uncontrolled marketing expenses", those expenses driven by the customer, by segment in your database on an annual basis. Calculate profit by segment on an annual basis. If uncontrolled marketing expenses drive customer segment profitability down, test a different allocation of controlled marketing expenses. "This time, market players seem truly horrified — because they’ve suddenly realized that they don’t understand the complex financial system they created." Those words apply to the multichannel world we live in. Especially for those of us who spent our formative years in catalog. The internet has at least four components. It is part direct marketing, part retail marketing, part social media, and part something we haven't quite figured out yet. The last two components are frightening. Listen to the pundits as they tell you to dive into Facebook, only to have Facebook Beacon publicly broadcast what you purchased to the rest of the world. I mean, look at the list of companies that jumped in to this mess. Clearly, these companies would not have signed-up if they understood the complex environment they participated in. Most confusing is the fact that we've been trained to read the world in a "linear" or "additive" manner. We were trained to analyze one catalog at a time. Now, we're supposed to understand the complex interaction of mailing catalogs, delivering e-mails, executing a dizzying array of online marketing techniques, social media, search marketing, and traditional advertising. So we decompose these activities, believing we can assign "value" to each activity individually. The customer, however, using the ecosystem we created, uses combinations of marketing activities to ultimately get to the exact same place she got back in 1994, pre-internet. We created a complex ecosystem, full of interactions. We'll need to stop viewing the world in an additive, linear manner if we want to succeed. White Paper on Multichannel Forensics, 2,874 downloads. Wow, thank you! If you're so inclined, the book is available via my publisher, or via Amazon.com. My Biography, 1,698 downloads. Popular projects, 314 times. Interestingly, you downloaded 42 copies of my diminishing returns by pages circulated and circulation depth spreadsheet, after being available for just one day. The two-channel Multichannel Forensics worksheet has been downloaded 290 times in three months. The three-channel Multichannel Forensics worksheet has been downloaded 146 times in two months. Searches about the Square Root Rule, easily the most popular! A discussion about Multichannel Business Models. E-Mail Productivity, Is It Waning? ROI in Direct Marketing, a comparison of different advertising methods. Ten Ways We Ruined Multichannel Marketing. Thank you for your continued patronage of this site!